I attended a biodynamics workshop last weekend, one that encouraged us to fuse the principles of biodynamics with the principles of early childhood education, family life, and life in the garden. Not so hard and very exciting to be a part of! It was a low-key workshop, but everyone who participated left feeling fulfilled with good food, great ideas, wonderful company and a newfound sense of community. Never before have I attended a workshop with so many follow-up communications from ALL the participants! Already there are plans to share plants and help with each other in their gardens and kitchens … and delight in each other’s success with cooking! This is what biodynamics encourages! We began our first day by scrounging around the area for materials to make a big compost for the garden at Finger Prints Children’s Centre, where the workshop was held. Beginning with large, rough garden materials at the base to encourage the flow of air, we alternated layers of vegetable scraps, cow manure, weeds and other green matter, chicken poo and lots of water. The whole thing was covered with a blanket of sugar cane mulch, sprinkled liberally with biodynamic preparation 507 and then before it was left to do its thing, the final ingredients were added: specially rolled balls of worm castings encasing 1 gram each of biodynamic preparations. These were brought out on a silver tray as if they were to be presented for a tea party, and naturally this, and the ritual that followed appealed to my inner Priestess immensely 🙂 Prior to each preparation being buried in the compost mound, our workshop facilitator, Sandra Frain, discussed the qualities of each and the unique gifts they would contribute to the processes of the compost. Each preparation works strongly with a particular soul energy, planet, mineral and body organs, and given this information the person who was placing the preparation in the mound decided on the best place to bury it. The compost mound was built up like a compass needle, lying North/South, the wide sides exposed like solar panels to absorb the morning and afternoon sun. After it was built (with help from everyone who attended), the compost was likened to a human body, and the preparations were buried in places considered to approximate the body organs each preparation represented. After a lovely great splash of water – flicked and sprinkled, rather than poured, to ensure that the energy carried within the water was not lost – the compost heap was all wrapped up in a blanket of sugar cane mulch, cosy at the bottom of the garden. All there is to do now is to let it lie and soak up the sun. Inside that blanket all the little creatures of the earth will do the job of breaking the compost down into moist humus. No need to turn, no need to wake it up and disturb it with prickly pitch forks! I just loved the way Sandra painted pictures for us with her words. 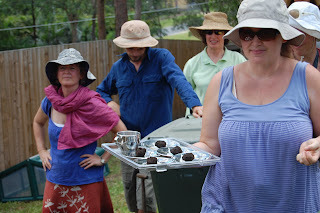 At the end of the workshop we gathered around the compost and held hands. We sang Allelujah to the compost and honoured the work it does to sustain life and good health. A verse was read before we all tip-toed off up the hill to the tunes of “Spiky-Faced Bindy Man” – but that is another story!! Later that evening I reflected on the day, and realised that I already knew all of this about compost making. It isn’t difficult to understand, or to create, and although I didn’t know about the wonderful biodynamic preparations before, I have watched my mother make compost all my life. I have internalised the process. Indeed I have never felt truly comfortable tossing vegetable scraps in the bin when I have experienced my mother lovingly burying them within the compost at the back of the house, and then seeing (and smelling!) the lovely dark brown earth that had been magicked out of garden ‘rubbish’ be put to use in our beautiful garden. I remember feeling the intense heat from the compost rising from the mound and radiating outwards while it was ‘cooking’ – and I remember my amazement at the fact that all the little creepy crawlies could live – no, thrive! – in those temperatures, while other things that would make the compost unhealthy were burned away. Love compost….read a good book about compost once…called “Ressurection in a Bucket”…..
One of the best things about gardening is making compost. Here are some ways I like to use it: sprinkle it on pot plants they love it; use it when you put your seedlings in the ground to give them a good start; make a compost tea, strain and spay onto plants especially those looking a little sickly it strenghtens their cell walls; or add the tea to a little seasol mix and spray around strawberries they love it. 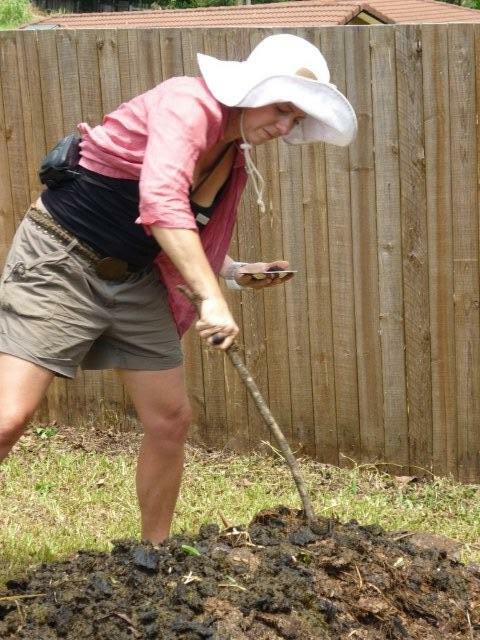 Happy composting the biodynamic way. this is my Mum, folks!